We are joining the dead today. I draw Arayo near and we pass through the tall gates on which statues rest, eyes closed, mourning those who have left this world. Those we are about to encounter. Quietly, we make our way into this place where spanish moss drips from tree branches that reach across roads - like rotting skin which has lost its hold on long boney fingers. As far as we can see, stones and statues mark the place where the dead lay. The bodies of Civil War soldiers and ashes of Holocaust victims share the grounds of the Bonaventure Cemetery in Savannah with politicians, authors, mothers and children. It was brought to international attention when a haunting photograph of one of its statues - a young girl holding two bowls - became the cover for the book "Midnight In The Garden of Good And Evil". The "Bird Girl" has been removed, but the photographer, Jack Leigh, died too young and today rests within these grounds. Possibly one of the most haunted cemeteries in America, we watch for the pack of ghost dogs, said to roam this place - growling and barking their intimidation of the living. Perhaps they are guarding little Gracie Watson who died at the age of 6. Buried beneath a life-like statue, the little girl was so beloved that even into death, visitors bring her trinkets and leave them at her grave. If they are removed, the statue cries tears of blood. But, it is not for these that we search. We have come to this place, for Arayo has a special connection to one who rests here. Officially named "Capriccio's Life's What U Make It", after a song written by lyricist and composer Johnny Mercer, we've come to visit the grave of the man responsible for her name. Beneath a simple flat stone, Johnny Mercer rests, though a bench has been placed across from his grave. Inscribed with the names of some of his more famous songs, an etching of his profile adorns the top. A couple weeks ago Johnny would have celebrated his 101st birthday and someone marked the occasion by placing a red rose on his grave and stringing a tacky birthday banner on the bushes behind. 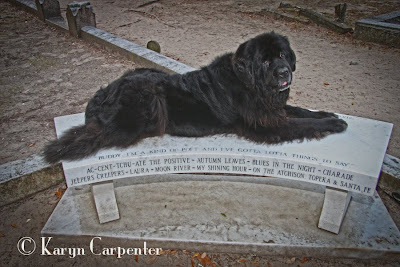 Is Johnny Mercer hanging around, waiting for visits from Newfoundlands who's names contain his song titles? Perhaps. 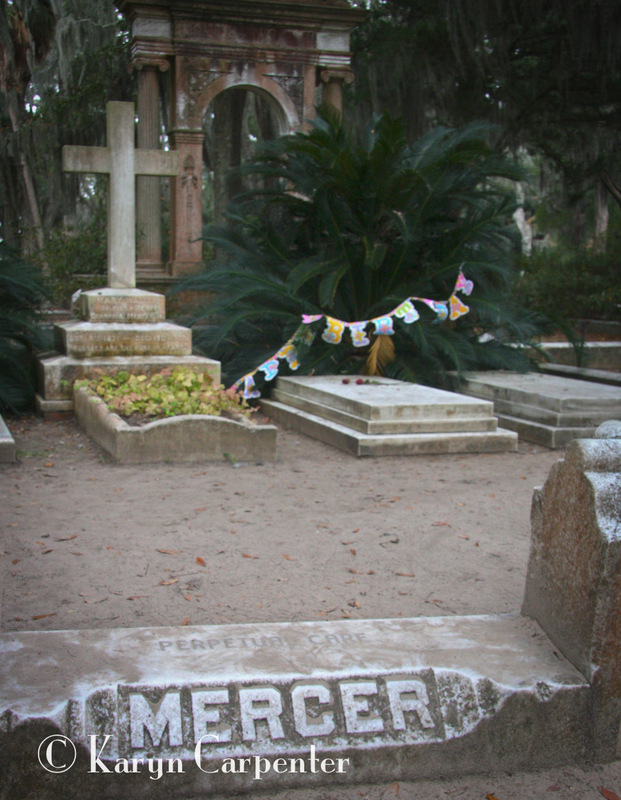 It is reported that someone visiting his grave once began softly singing some of Mercer's songs when a mist formed in a stream of sunlight near the grave. The mist disappeared as quickly as it came but those who witnessed it suspect he may drop around to visit from time to time. Or maybe its just some of "That Old Black Magic". I so much enjoy Arayo's journey through this wonderful land. Every day I check your website, thank you again for sharing both of your stories for all to enjoy. Also I wanted to say that the photos you took on Rosie's day were beautiful in honor of her. That was wonderful, Karyn! Loved the picture! Hope you and Arayo were singing for Johnny, too. He brought the world so many wonderful songs. Arayo's dam, Ch Capriccio's Autumn Leaves, was one of eleven puppies with Mercer song titles. Jeepers Creepers, I Wanna Be Around, And The Angels Sing, Tangerine and Autumn are still alive at 11 years 3 months. We lost In My Wildest Dreams, Midnight Sun and Early Autumn in the last year. Arayo is one of ten puppies, so I continued the theme for these ten, as I so love Johnny Mercer's work. Here's hoping they have all inherited their dam and grand dam's longevity, especially Ms. A! And no, I'm NOT morbid! :) I think. And what a great name for a Newf: "That Old Black Magic" -- did Arayo's dam's litter have a dog w/ that name? Once again, the list has made my day.